One of my most exciting decisions I have to make around the end of the summer is about my Christmas collection. This year I couldn’t decide between Elegant Messages that was started the year before and the images for Poinsettia Promises. So I decided to go for both as they are very different. 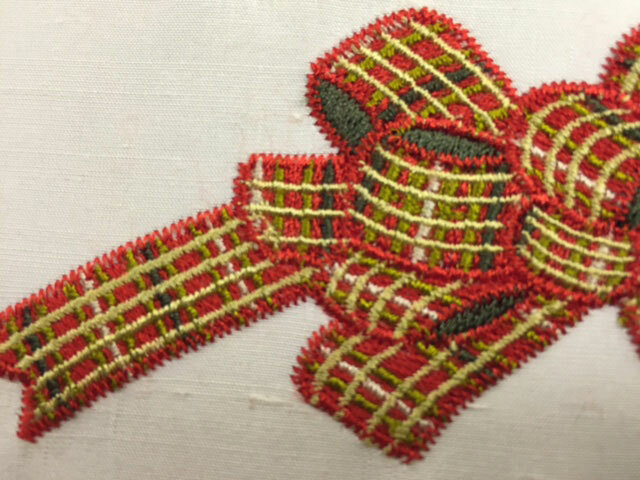 However nestling among the many images from Diddybag was a very elaborate bow which I dismissed as a ” digitising impossibility”! As I was finalising the designs for the larger hoops I looked again at this beautiful lavish tartan bow and decided that it was too good to pass by. Rising to this challenge I looked at the colours and decided to go for all 5 so that the richness of the ribbon is not lost in the embroidery. My first attempt need a great deal of tweaking to eliminate as many jump stitches as possible. So I have to admit that it took a long time to digitise just one bow. Then I stitched it out and it was far too dense and my poor machine was struggling. However the overall look was good so I breathed a sigh of relief and reduced the density and underlay for the majority of the ribbon details. Here is the finished bow in all its glory. The edging gives it a lovely finish and I think it would work as a stand alone design for any decoration. The dark green insides of the ribbon give it depth. Next time I think something is impossible I will not dismiss it. After all the best results in embroidery can take considerable effort and time. This has encouraged me to go for another huge digitising challenge which has been sitting on the back burner for quite a few years, and hopefully will come to fruition in 2015! 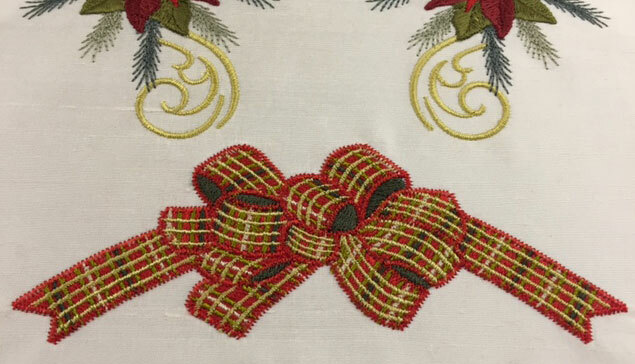 You can see the detail of the ribbon in the close up. I hope you all like it. I am in the process now of adding it to other forthcoming sets in the collection. The design is part of Poinsettia Promises 2 for 5″ by 7″ hoops which will be released on Monday 22nd December, 2014. This entry was posted in Announcements and tagged Christmas. Bookmark the permalink. That worked out wonderfully well, Hazel….. Just like all you set your mind to. You have earned your Christmas holiday ! Just BEAUTIFUL! What an accomplishment, Hazel! I love it! Congratulations on expanding your comfort zone and what a wonderful job you did on this bow. It’s beautiful, Hazel! All of your designs are so elegant. Merry Christmas! You are one talented lady! The bow is wonderful and is so detailed. Merry Christmas !